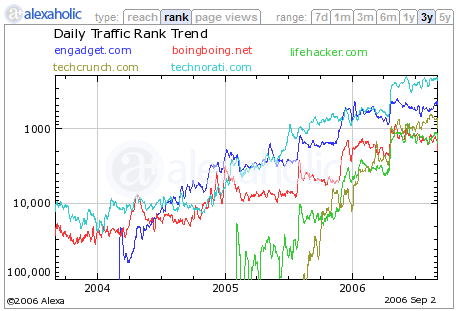 You probably know that Alexa.com [owned by Amazon.com] provides traffic rankings and page views information of any website based on the surfing habits of Alexa Toolbar users. While Alexa rank information should not be interpreted as an exact measure of popularity of web sites, it does give fairly reasonable data when we are comparing the traffic stat of two or more web domains. If you are planning to use Alex to get a rough idea about your competitor's website, try Alexaholic - a service that's based on Alexa but lets you compare traffic charts from upto five different web domains. Alexaholic has a simple URL like alexaholic.com/sit1.com+site2.com... so you can construct it directly in the address bar. Another nice feature are the Alexaholic chartlets that create customizable and interactive traffic charts that you can easily embed in your website or blog. Alexaholic Recent page is like a Digg spy to see in real time what domains people are comparing across the globe. Nice destination to find new and interesting websites.